The above formula depends on the full price history at each point in time and took a while to compute. Hence, I want to share how Rcpp and RcppParallel helped to reduce computation time. I will use a historic dataset of the Foreign Exchange Rates as my testing data. It took a while to execute this code. Fortunately, the code can easily run in parallel. Following is the RcppParallel version. 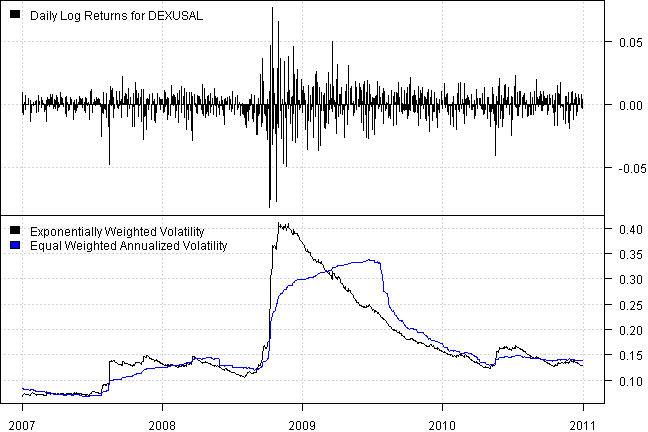 As expected, the Exponentially Weighted Volatility puts more weight on most recent observations and is a more reactive risk measure. For your convenience, the 2016-04-10-Exponentially-Weighted-Volatility-RCPP post source code.